#TheBigQuestion : Low Voter Turnout decays Jubilee 54.5% August polls to 34.5% total voter turnout. Where did the 20% go? - Bana Kenya News, Real African Network Tubanane. Home featured #TheBigQuestion : Low Voter Turnout decays Jubilee 54.5% August polls to 34.5% total voter turnout. Where did the 20% go? #TheBigQuestion : Low Voter Turnout decays Jubilee 54.5% August polls to 34.5% total voter turnout. Where did the 20% go? The political analyst has been asking questions that IEBC has declined to answer them following the contrast between the Augst polls and the October polls. The same questions were also asked by the NASA leaders led by Musalia Mudavadi at the Okoa Kenya headquarters. Does it now show the server have been opened by Kenyans on the ballot? Contrasting October Polls with August Polls. Free transport to Meru, Kirinyaga, Narok, Kajiado, Embu and other parts of RiftValley which was not there in August polls. Physically challenged people and sick people were carried to the polling stations to vote which was somehow able in August polls. Good handouts were all over in the Jubilee strongholds compared to the last polls. No queues were seen in the NASA strongholds that did not have violence and protest. Despite more points that favoured the Jubilee strongholds the voter turnout was about 34.5 percent as the IEBC Chairman rectified after saying it was approximately 48 percent. 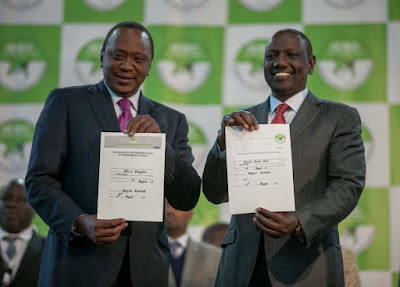 How did the Jubilee party lose 2 Million plus votes in just Two Months? Uhuru Kenyatta got 54.5 Percent in the August polls and now the total votes cast across the country stay at 34.5 percent. Where is the difference between what happened in August polls and October polls? Approximately 20 Percent have disappeared in the ballot boxes of the IEBC as the Chairman declined to answer some of the questions. Voting on Thursday was marred by skirmishes between police and stone-throwing opposition supporters, who prevented polling stations from opening in four pro-Odinga counties, forcing election officials to postpone the exercise by 48 hours. The election commission said more than one in 10 polling stations failed to open. Its chairman, Wafula Chebukati, Tweeted overnight that 6.55 million ballots had been cast - just 34.5 percent of registered voters. By contrast, turnout in the August election was 80 percent. The IEBC has repeated and emphasized that the Elections in the Nyanza region will continue as planned. This means that the only way to boost the numbers will be forcing the region to make sure at least 40 Percent of turnout is attained.